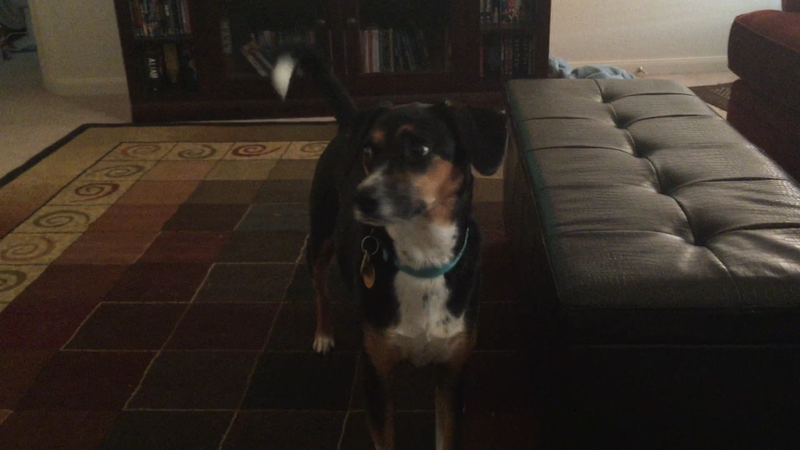 Came home from work today to find darn dog Chloe able to wag her tail. She either hasn’t wanted or been able to since back surgery to relieve a bulging disc near her rear end/tail. But today, a week after she came home from the doggie hospital, she’s wagging it like crazy. It’s good to see because it’s another sign her back is feeling better. And just because she has always been a tail-wagging dog. It’s one way she communicates with us non-dog speaking peeps. She also rolled on her back today — over the 13 staples — and it didn’t seem to bother her. I didn’t see her do it until it was too late or I would have tried to stop her. Darn dog. Don’t want her pulling the staples out! She looks great, Julie! Happy happy. That is absolutely fabulous!! It’s celebrating time! Most definitely! We are happy. Yay Chloe! Brave, happy girl! She’s definitely happier. This morning she was in the living room and I went to the kitchen to get her medication, when I came back, she had my granola bar and the napkin it was on in her mouth. I had to pry open her mouth to get the napkin out. The granola bar was mostly gone! Haha. Yeah, she’s right now!